Kenta Fukasaku's new film, YoYo Girl Cop opens in Japan at the end of the month. It may look like a mad concept, but in Japan it's just another revival of an eighties TV show. 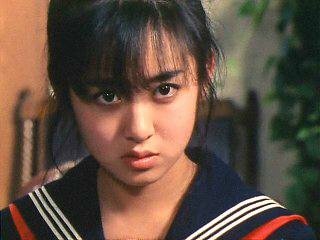 Indeed, as a homage to the original TV Sukeban Deka, actress Saito Yuki will appear in this new movie too. 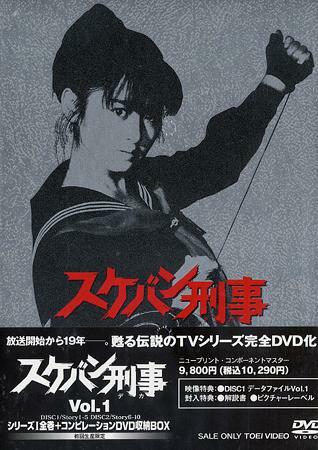 I've reviewed the spin-off movie Sukeban Deka: The Movie, the sequel and the OVA anime, and now I'm enjoying watching the original TV series. 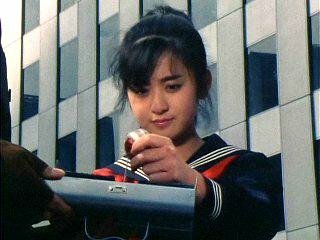 Undercover cop Saki Asamiya (played by the dangerous-looking and pouty Saito Yuki, below), gets missions from her Controller, Jin, who has a habit of appearing in her bedroom, unannounced! Though she appears moral and selfless, Saki is being blackmailed by the authorities, on a promise to release her murderous Mom from prison. She gets messages from the 'Dark Director' who, like Charlie, talks to her on a speakerphone. Off she goes on missions armed only with a deadly steel yoyo (with a police badge hidden inside). When she's not sorting out corruption amongst the teachers at her own school, she's sent on special visits to other schools - like the creepy catholic high school where the girls are dabbling with Satanism (I love that episode). Most of her cases culminate in Saki frightening the baddies with her steel yoyo, usually by breaking flimsy furniture or a couple of vases. The cramped, badly-lit studio sets and shaky handheld camera work, add to the cheesy fun. The catchy soundtrack seems to be made up around 6 endlessly recycled tunes, occasionally boosted by villainous classical tunes like Wagner's Ride of the Valkyries or Bach's Toccata and Fugue in D minor. It's a cross between schoolroom drama and Yakuza thriller. The school is so violent that the headmaster even carries a kendo staff. We see kids are pressured into suicide, stabbed, shot, punched and otherwise treated in a way you never normally see minors suffering in light-weight family action shows. It goes someway to explain that the violent schoolchildren of Battle Royale didn't come out of nowhere, they may have simply been a step up from shows like these. The first Sukeban Deka series starts off with very limited action scenes, but steps up a gear in episode 11 when a long story-arc takes us through the rest of the series. The story of the three evil sisters (also used in the anime) involves Saki's family, murder, mind-control and lots more fighting. Besides having a bullwhip, a crossbow and a rifle, her new adversaries are backed up by a gang of masked motorbike riders. The action accelerates to Kamen Rider type fights in a quarry, together with impossibly high back flips and huge explosions. While I miss her earlier cosier missions, these later episodes boast marvelous OTT plots, and mad James Bond ambitions on a ridiculously low budget. Highlights include Saki tackling the motorbike gang single-handedly with only a yoyo, a student struggling through a piano recital having just been stabbed backstage, and a brutal showdown in a flooded prison courtyard. Admittedly these are fairly low-rent thrills, but all-action schoolgirl thrillers are hard to find. Despite the low budget, the huge amount of physical stunts expected of the young cast is still impressive. The characters are fun, the plots outrageous, the acting enjoyably variable. The series is only available on Japanese DVDs without any subtitles. Perhaps the new film will popularise these outrageous and entertaining programmes enough for a worldwide release. Dozens of screengrabs and episode plot spoilers on the extensive Encyclopedia Idollica site, also dedicated to female Japanese pop idols.